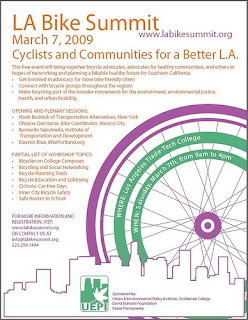 Check out the LA Bike Summit at Los Angeles Trade Tech College on March 7. This event will be held next Saturday from 9 a.m. to 4 p.m. and will feature guest speakers from Mexico City, New York, and Portland, Oregon. Workshops will be held throughout the day and will cover a wide range of topics including transportation, health, and environmental issues. This is a great opportunity to learn more and provide your input on how we can strengthen and expand Los Angeles’s growing bike movement, as well as other transportation alternatives here in Los Angeles. Registration is now open at http://www.labikesummit.org/. Hope to see you there! 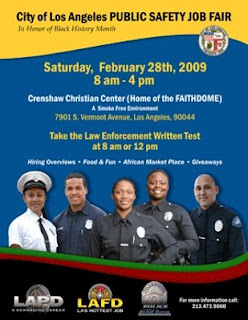 The City of Los Angeles is hosting a Public Safety job fair on Saturday, February 28. Find out what it takes to become a Los Angeles police officer or firefighter! Participants will be able to learn more about job opportunities and police officers, firefighters, and recruiters will be on hand to answer questions and give advice on how to prepare for the jobs. This afternoon I joined LAPD officials to announce a $75,000 reward for information leading to the arrest and conviction of suspects responsible for the murders of Khachik Safaryan and his 8 year-old daughter Lusine. Both were found dead by Lusine's sister in their East Hollywood apartment in December. As much as we celebrate our decreasing crime rate, the statistics don't mean much to a mother who has lost a daughter and a husband. Police believe that community members have information that could lead to the arrest of a suspect (or suspects). If you do, please call Hollywood Homicide Detectives at 213-972-1203. Raise your hand if you like to play sports! We all want our kids to be happy, healthy, and on a path to lifelong success. Selma Elementary School and the Hollywood Wilshire YMCA have partnered to bring students a new program to help them in all three areas. This morning I visited the school and saw 4th graders having a lot of fun learning about sportsmanship and the importance of living a fit and healthy lifestyle. In a public-private partnership, NCA Green provided the funding so that 400 students can exercise and learn basic sports skills with help from YMCA staff for the rest of the school year. This morning, my office hosted a Cash for College workshop at Belmont High. More than 50 high school seniors brought their parents to get one-on-one assistance with filling out the state and federal forms that make them eligible to receive financial aid for college. As a bonus, students who participate in Cash for College workshops become eligible to win a $1,000 scholarship through the program. A college education is the key to a better future, but figuring out how to pay for that education can be daunting. Cash for College helps students and their families take the steps they need to overcome these hurdles and open the door to a college education. Around the globe, Hollywood is synonymous with entertainment. This weekend, with the Academy Awards, everyone will be reminded of Hollywood’s status as the world’s entertainment capital. No matter which movies or actors you’re rooting for – we all want to make sure that the Oscars continue to be a safe and secure event for all involved. Today I joined LAPD Chief Bill Bratton to announce LAPD's collaborative effort with the Department of Homeland Security to use a new aerial technology system at this year’s Academy Awards. Called LA Shield, the system will enable LAPD to better assess security of the infrastructure around the Kodak Theater and allows for real-time exchange of information with police resources on the ground. Each year, LAPD has ensured the safety and security of those attending and working at the awards ceremony, and we expect that this year will go just as smoothly. This morning I greeted more than 120 City Year volunteers in the Tom Bradley Ball Room at the top of City Hall at their annual Civic Awareness Day. Today’s seminar allows these volunteers to discuss their work with local officials and learn more about how city government works. City Year volunteers dedicate a year of service to addressing some of the most pressing educational needs in the schools that need them the most. In only its second year of existence here in Los Angeles, City Year volunteers have spent thousands of hours helping to ensure L.A. students have the resources needed for success. I am so pleased that the federal economic stimulus plan’s includes $198 million for Filipino veterans who fought during World War II. Stripped of their status as U.S. Veterans through the Recession Act of 1946, Filipino veterans were denied the benefits they had been promised during the war. Finally, after a long struggle, Filipino veterans are receiving recognition and respect as the heroes they are. Their long journey from soldier to citizen is one of the most moving, untold legacies of World War II. These funds fulfill a promise to the 15,000 surviving veterans, many of whom live right here in Los Angeles’ Historic Filipinotown. Community residents working for change! Since President Obama's campaign, Americans are more aware about community organizing. It's something in which we have long believed in my Council office. 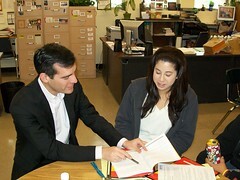 This morning I spoke to a group of Angelenos participating in our Government 101 workshop. I started these workshops because I strongly believe that change in our communities comes from the ground up, and it's important for people to understand how government works in order to participate in it. In the half-day workshop, today's attendees are learning about the City's legislative process, how to read City Council agendas, how to monitor City Council meetings, and how to effectively influence the legislative process. I'm proud that since 2001, hundreds of emerging leaders have participated in our workshops to learn how to organize their communities and affect government. Last night I attended the Rampart Village Neighborhood Council meeting. It was a thrill to see that the group had blossomed into a full-fledged Neighborhood Council advocating for the interests of the community. Less than five years ago, this was a group of neighbors that met informally. After that, I stopped by a meeting of the Glassell Park Neighborhood Council where we discussed a number of important issues, including the recent demolition of a house used by the Avenues Gang for narcotics and weapons dealing as part of our efforts to improve public safety in the Drew-Estara area. Yesterday I was pleased to join President Bill Clinton and Mayor Villaraigosa to announce our effort to replace 140,000 existing streetlights with more energy-efficient LED bulbs. 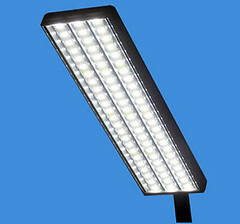 Currently, our streetlights use 197 million kWh of energy and cost about $15 million per year. This project will reduce Los Angeles's carbon dioxide emissions - about the equivalent of taking 7,400 cars off the road annually -- and save the equivalent of 9,800 households’ annual energy consumption. On top of that, when the program is fully implemented, the savings to taxpayers will be $10 million every year. It was exciting to join President Bill Clinton (checking out new electric vehicles in the photo), members of Congress, business leaders, and others for a roundtable discussion on sustainable building. As we move to turn our economy around, green building is a new industry sector that makes sense for our earth as well as for business. Our discussion was held in Hangar 25 in Burbank, the world's only LEED Platinum-certified aviation facility. I was proud to offer some insights about Los Angeles's Green Building Ordinance, which I authored last year. It requires that all new projects bigger than 50,000 square feet show compliance with LEED-Certified standards. It also impacts more square feet of building than any other city in the country. This morning we celebrated the 100th Anniversary of the NAACP, which has been fighting for justice, equality, and civil rights for all since its inception. It was a particularly exciting moment for me because it gave me the opportunity to welcome to City Hall my good friend from college, Ben Jealous (third from left in the photo), who recently became the organization's national President and CEO. In the last 100 years, our nation has come a long way toward advancing educational, economic, and social opportunities for all, but we know that there is still more work to be done, and I know that Ben is just the right leader as the organization embarks on its next 100 years. Last night I joined LGBT community leaders and Silver Lake neighbors at a celebration of the Black Cat Bar's designation as a Historic Cultural Monument. In 1967, the bar (now known as Le Barcito) was the site of a major protest in support of human rights after a police raid resulted in the arrest of 14 gay men. I strongly believe in human equality, including marriage rights for the LGBT community, and was proud to be part of this celebration. I want to make it easier for people to ride their bikes in our city. One of the things we are doing to that end is creating more places for cyclists to park. 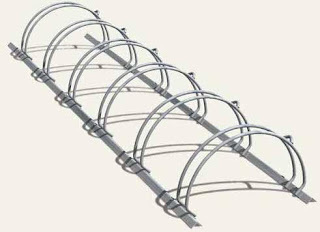 I’m partnering with the Bike Writers Collective and the Los Angeles Bicycle Coalition, with the support of the Hollywood Community Redevelopment Agency to sponsor a competition for approximately 24 new unique bike racks for the East Hollywood community. We are encouraging all artists, designers and bike enthusiasts to submit innovative proposals that will help our city reduce traffic and clean up our environment. Click here for more information. I just got back from LAPD Northeast station where we announced two arrests in the cluster of robberies and attacks that recently occurred in Silver Lake. The two suspects are known gang members, age 15 and 16. 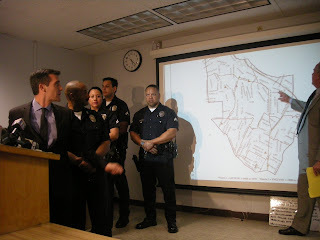 A search warrant of their homes resulted in the discovery of guns as well as iPods, cell phones, and other items that connected them to three robberies, including two of the recent incidents in Silver Lake (in which one victim was punched and kicked and the other was cut on the forehead with a sharp object). This investigation is ongoing, but I want to thank the men and women of the LAPD for their work in this case. I know they are continuing their investigation into the other robberies and attacks in the Silver Lake and Echo Park areas and won't rest until we bring the perpetrators to justice. I want to thank the hundreds of residents who came to a meeting at Ivanhoe Elementary School last night to learn more about the recent robberies and attacks in Silver Lake and Echo Park. If we are all vigilant, take precautions, work with LAPD, and watch out for each other, we can prevent more of these crimes from happening. Los Angeles Police Department officials believe the crimes may be gang-related and ask anyone with information about these attacks to call the Northeast Gang Detectives at: (213)847-4263. Today we razed 3304 Drew Street, a house in the Drew-Estara neighborhood notorious as a base for the Avenues gang to sell narcotics and lead other neighborhood gang activity. Between 2002 and 2005, the LAPD conducted 14 narcotics operations at this house that resulted in 13 arrests and the confiscation of drugs and automatic weapons. Although the family that lived at this Avenues Gang nerve center was evicted and ordered to stay away from the home. Thanks to a successful lawsuit by City Attorney Rocky Delgadillo through the Citywide Nuisance Abatement Program, we were able to get rid of this home that was a blight on the community. I am proud to represent this neighborhood for all of the law-abiding families who live here. We’ve worked together to turn this neighborhood around by reducing crime, increasing job opportunities for adults and educational and recreational opportunities for kids, and beautifying the neighborhood with nice new places like Juntos Park down the street from this house. Last week in this neighborhood my office coordinated a health fair at the park. We’ve hosted numerous job and community resource fairs, gone door-to-door to hear directly from residents about their concerns and ideas and to encourage them to get involved, led public safety seminars, hosted neighborhood clean ups, held school forums, and more. Today, we took yet another step toward making this neighborhood a cleaner, safer place for families. The Los Angeles Police Department will host a community meeting at 6 p.m. tomorrow night (Thursday, Feb. 5) at Ivanhoe School to discuss the recent string of robberies - most including the use or brandishing of a weapon - in the Silver Lake and Echo Park areas. Ivanhoe is located at 2828 Herkimer Street near the intersection of W. Silver Lake Drive and Rowena Avenue. Tonight I joined Councilmember Tom LaBonge and Captain Lance Smith of the LAPD's Northeast Division to give a community update on a recent string of robberies in the Silver Lake and Echo Park neighborhoods. In most cases these robberies included the brandishing of a weapon (primarily knives), and several victims were actually harmed in the robbery. In Silver Lake, since January 29, there have been four incidents in the area around Hyperion and Rowena in the last week. The suspects are target single males. In Echo Park, since December 30, there have been six incidents in the area around Sunset and Alvarado. These suspects also target single males. These incidents are a reminder that even at a time when our city's crime rate is at a historic low, we still must be vigilant in our neighborhoods. The Los Angeles Police Department is working to stop and prevent more of these crimes, and I want to thank them for their efforts. They have increased patrols in these areas. They also encourage people walking in these areas to walk with another person, particularly if it is dark, and to walk along well-lit paths. The safety of our neighborhoods is my top priority. My office will continue to work with LAPD and Councilmember LaBonge to monitor the situation. If you have any information about any of these incidents, please report them to LAPD Northeast Division so that we can bring the perpetrators to justice. The average college graduate will make $1 million more in her lifetime than the average high school graduate. It's vital that we prepare our young people to go to college and then make sure they can afford to go. This morning I joined the Mayor, Councilmember Reyes, and the Los Angeles Area Chamber of Commerce to announce that Cash for College financial aid workshops are this Saturday, February 7, at more than 40 locations across Los Angeles. Volunteers trained to fill out complicated financial aid forms needed to qualify for state, federal, and other financial aid will be available to help students and their families. In addition, my office will be hosting a follow-up workshop on February 21 from 9 a.m. to 2 p.m. at Belmont High School. Hope to see you there!